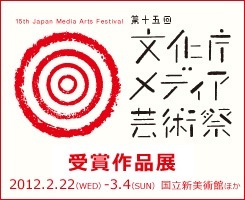 “muse’ic visualiser” was “honorary mentioned” at Japan Media Arts Festival. Two of Qosmo-related works, “ToyToyota” and “TinyRiot“, also won the same award. “muse’ic visualiser” が文化庁メディア芸術祭でエンターテイメント/アプリケーションソフトウェア部門の審査委員会推薦作品に選ばれました. Qosmo関連の二つのiPhoneアプリ “ToyToyota” と “TinyRiot“も同じ賞に選ばれています! !